The former Cathedral (Trinity Church), Shanghai, China. Sir George Gilbert Scott, but modified by William Kidner (1841-1900), a memeber of RIBA who had recently come out to the settlement. Located, according to C. E. Darwent, in "the central district, south of Nanking Road, and making, with the Town Hall and other prominent public buildings there, a townscape "worthy of a great city" (16). 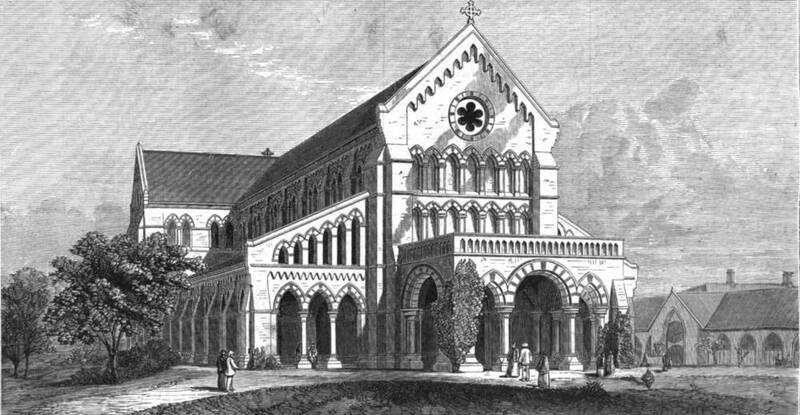 Illustration source: The Illustrated London News (10 March 1877): 229. Click on image to enlarge it. The church became a Cathedral in 1875. It would be interesting to know how Kidner modified it, and whether these modifications were just to suit the local climate, or to alter the actual style of the church — it is certainly more Italian Romanesque in style than most of Scott's work. However, this is not entirely out of keeping with his work at home: Gavin Stamp describes it as "somewhat Ruskinian" (73), and in this it can be compared with his 1854 design for the apse of Camden Chapel, Camberwell (see Stamp 50), produced when he was in close contact with Ruskin. This was, in fact, a period when Scott was refusing to be confined by the straitjacket of what he himself called "revived conventionalism" (205), and experimenting in a mild way with different styles. Indeed, in his autobiography Scott suggests to other architects too that they might "retain all the good" that they have picked up on the foreign travels, "and use it up in [their] reformed architecture" (213-14). Probably Stamp's general remark, to the effect that Scott's colonial church designs were "characteristic of Scott's work in Britain, if with adaptations to local conditions" (73), applies to this building as well. According to much more recent sources, the cathedral, which came to be used by the local government, has now been restored as a church. It is heartening to learn that the restorers did "a superb job" (Welch). Image scan, caption and formatting by George Landow and commentary by Jacqueline Banerjee. You may use this image without prior permission for any scholarly or educational purpose as long as you (1) credit the photographer and (2) link your document to this URL in a web document or cite the Victorian Web in a print one. Click on the image to enlarge it. Denison, Edward, and Guang Yu Ren. Building Shanghai: The Story of China's Gateway. Chichester: Wiley, 2006. Google Books (preview only). Web. 21 May 2017. Scott, Sir George Gilbert, R.A. Personal and Professional Recollections, edited by his son, G. Gilbert Scott, F.S.A. London: Sampson Low, Marston, Searle, & Rivington, 1879. Internet Archive. Web. 21 May 2017. Stamp, Gavin. Gothic for the Steam Age: An Illustrated Biography of George Gilbert Scott. London: Aurum Press, 2015 [Review]. Welch, Ian. "One thought on 'Welcome To Trinity Congregation – Shanghai,'" on the Welcome to Trinity Church web page.